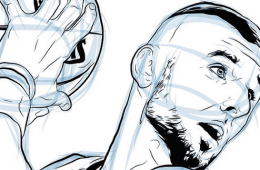 Washington Wizards big man Marcin Gortat aka The Polish Hammer sketched by Robert Generette III from Washington DC. 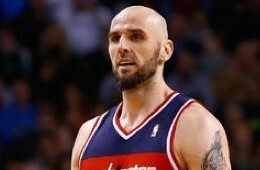 Marcin Gortat became the first Wizards player with 30 points and 15 rebounds in a playoff game since Moses Malone did it in 1987. Wait a second. Something about this huddle isn't right.